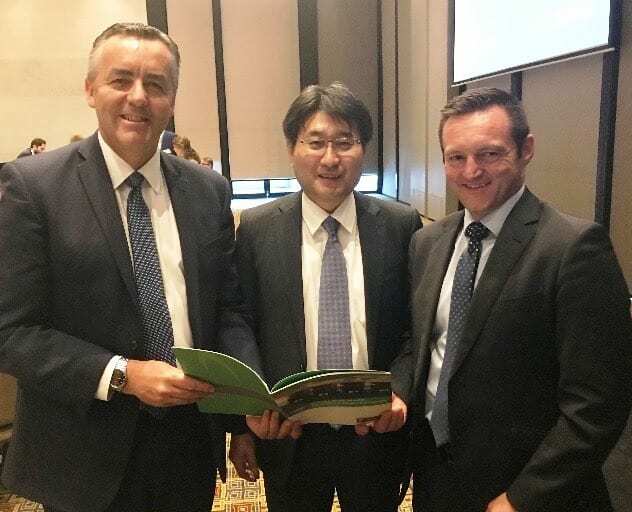 Attending the launch of the Energy to Waste feasibility report are Federal Member for Gippsland Darren Chester, Australian Paper Chief Executive Officer Yasu Murakami and Latrobe City Council Chief Executive Officer Steve Piasente. The report found construction of an Energy to Waste plant at Maryvale Mill to be credible, with waste supply the major challenge. Federal Member for Gippsland Darren Chester says “the most exciting job creating-proposal in the Latrobe Valley for decades” has moved a step closer to reality with the release of Australian Paper’s feasibility study into an Energy from Waste plant at the Maryvale Mill. Mr Chester spoke at today’s launch of the feasibility study which he says can help solve Melbourne’s waste disposal problems, while creating a long-term energy solution for the mill which currently employs more than 800 people. “The three most important issues in the Latrobe Valley today are jobs, jobs, jobs,” Mr Chester told today’s launch in Melbourne. “It’s important to note this project relies on Melbourne’s ever-growing waste stream which currently goes into landfill and creates environmental issues in itself,” Mr Chester said. “At the same time, if it’s developed, it will secure Australian Paper’s energy needs and allow for more gas to be released onto the domestic market. Deputy Prime Minister and Minister for Infrastructure, Transport and Regional Development Michael McCormack said the study would allow the Federal and Victorian governments and Australian Paper to make a fully informed investment in the Latrobe Valley’s future. “Projects such as this can be game changers for regions – Australian Paper has previously estimated that a plant would support up to 1,600 construction jobs and 40 direct ongoing roles – so we will be very interested to see positive benefits coming from any future plant,” Mr McCormack said.